No one wants to have their ability to hear compromised, but if you are musician, this fear is compounded by the fact that your daily pleasure, and perhaps monetary living, depend strongly on this sense. Yes, Beethoven managed, but if we have the choice, let’s keep our hearing intact, right? And do we have the choice? Obviously, there are some factors outside of our control, but when it comes to the very irritating (and sometimes out-of-your-mind-infuriating) problem of Tinnitus, is it possible there are things musicians can do to prevent it? For a brief stint in 2011, Soundcheck aired a program called Ear Wars, and in one episode, they feature Dr. Neil Sperling of the New York Otolaryngology Group, who gives us a little more insight into Tinnitus. Tinnitus is the perception of internal sound that usually only the individual can hear. In this way, it’s tricky because it doesn’t have a single causal relation with the body. It’s sound (ear), but it’s also the perception of sound (brain). Most likely, it has been caused by some damage to the ear, but it’s the brain that is trying to make sense of this by sending out a sound of some sort. And this sound can vary greatly. It can be the typical sound we think of when we hear of Tinnitus– a ringing in the ear (and even ringing can vary a lot), but it can be the literal sound of crickets, it might sound like traffic, it might even be a musical song itself (Ally McBeal anyone?). You can hear a sample of various common Tinnitus sounds at the American Tinnitus website here. The causes of Tinnitus are not entirely known at this point, although it is something that tends to happen in the older population with the natural decline of hearing. Some medications and chemotherapy can cause Tinnitus too. People who have jobs where they are exposed to loud sounds for a long period of time are more at risk (think factory workers), but as for musicians, or people who love listening to music…? The rise of headphones, earbuds, very loud concerts and sound systems–none of these things are exactly good for the ear. It can vary, but the volume, proximity and duration all play a factor. Easy obvious preventions? Turn the volume down. Use speakers when you can. Give yourself breaks. But all of these tips don’t matter much if you already have Tinnitus, and again, you may have it even though you don’t have any known risks toward developing it. Many people suffer from it thinking there is no treatment, and while there may not be a simple fix, there are some therapies that have been shown to help. First of all, Dr. Sperling recommends that anyone with symptoms see a professional, as Tinnitus is really just that–a symptom–and it could be a symptom of something larger that is treatable (for instance, a tumor, which is rare, but again, is often treatable). If everything else checks out, then know that there are things which can be done to ease Tinnitus. From medications, electrical stimulation, and TMJ treatment, there are options. There are even therapies which are designed to retrain the way your brain perceives the sounds. In any case, if you suffer from Tinnitus, don’t assume that this will always be your fate. And if you don’t suffer from it now…well…much is out of our hands, but if you have any power to protect your precious ears even a little bit while you can…I would seriously consider doing it. Because to hear the roaring sound of a subway when you’re trying to record an album (or have dinner with a friend or read a book to your child or have a good night’s sleep–for that matter!) is far from ideal. Share your thoughts: Do you suffer from Tinnitus? Have you found anything helps relieve the sound you hear? How has it affected you in your musical career (or otherwise)? Do you have any advice or tips? Cover song marketing is still one of the best ways to promote your band on Youtube. And hey, Justin Bieber’s new song, “What Do You Mean”, has already garnered 70+ million hits in only two weeks. Google search volumes for the track’s lyrics, mp3 download, video and acoustic version are skyrocketing. 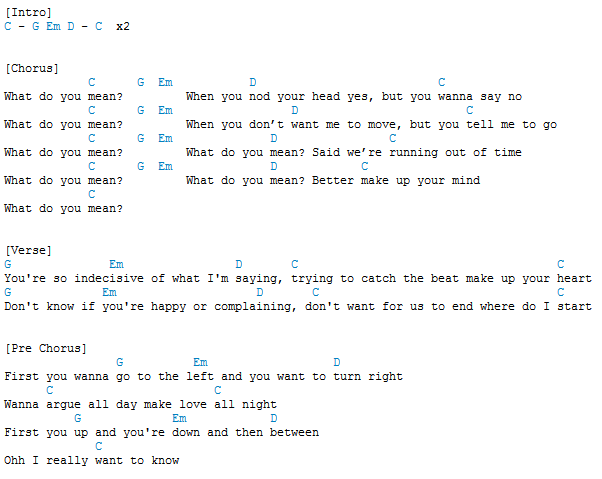 This post is your own personal “What Do You Mean” chords and cover kit. Learn the song, record yourself playing it, customize your video title with strategically placed keywords and publish it on Youtube. See what happens. Maybe nothing. Maybe something. You won’t know unless you try. Here’s a pretty simple set of basic chords for What Do You Mean to get started. This video isn’t all that helpful for learning how to play What Do You Mean chords, but I was impressed by its production value and thoroughness. Hey, if these musicians can do it, so can you, right? Promote yourself! Okay, that’s enough Justin Bieber-induced pain to last a long, long time. * Image at the top modified from one created by Luigi Severus at Deviant Art. Thanks for making me laugh, Luigi! If you’re reading this blog, surely you’ve thought about starting a band at some point in your life. Whether you dreamed of playing to sold-out stadiums, or simply to hacking a few local gigs to wow the local scene, it’s all about sharing (and showing off) talent. Actually starting a band can be both hugely exciting and incredibly painful. Here are some pitfalls many of us have faced when starting a band. Are all the band members’ goals aligned? It’s important to ensure that all members of the band are on the same page. How often will the band practice? What kind of music will the band play? How will the band split songwriting credits? Who plays what? Bands require compromise, but if everyone has different goals, the band’s toast. It’s been a long time since I’ve written, and I thought I’d share some random, late night thoughts about a band. Someone told me that if I was a Lord of the Rings fan, I’d like Florence and the Machine. That seemed like an odd statement, so I put it to the test (I love LotR), and voila, I’m now a fan of the band. They’re touring America this month to support their new album “Ceremonials,” and Florence and the Machine tickets are currently available. As with many breakout bands, appearance in various media launched their success, making it yet another good case study for the “screen to mp3” success story. Let’s walk through it. Florence and the Machine’s unique sound is the key to their success. Florence Welch’s haunting voice overlaid on ethereal backing tracks creates a cloud of mystery around the listener. The complex harmonies combine with enough thump in the bass to remind the listener that this is a rock band. The band’s sound has been categorized at various times as English art rock or even soul. Perhaps the best description is pagan rock. The melodies and soaring vocals are reminiscent of New Age music from the 1980s. The group appeals to a segment of rock fans who in earlier days might have listened to more pop-based bands. Although this segment is small, the band is fortunate to have been noticed by the mainstream media. Early in their career they were featured on the program “BBC Introducing.” Since then, their songs have been picked up for play on numerous television programs and movies, including “Wild Child,” “Eat Pray Love,” “Saving Grace” and many others. The recent “Snow White” gig was the latest in the string of soundtrack appearances which have given the group widespread exposure. Since “Ceremonials’” debut, the band has also released two singles, “Breath of Life” and a remixed version of “Spectrum (Say My Name).” “Breath” was featured as the theme for “Snow White & the Huntsman.” “Ceremonials” reached the top spot on the UK charts in its first week. It peaked in sixth place in the U.S. The band also received two Brit Award nominations for the record. When the tour concludes, the band will begin work on their third album. it could be a minute or two before the group is back on tour, so now is the time to scoop up those Florence and the Machine tickets. And while some bands can’t seem to crack the music monopoly dominating the mainstream, that’s never a reason to stop to forging ahead and making music that sends ripples across airwaves, earphones, and attention spans of an infinite audience. Creating music on your own terms is still very much possible today. The fact that millions of people own smartphones these days means independent bands like yours have an exciting new audience to explore. Think along the lines of a band-specific mobile app dedicated to spreading your music. Bands can get exposure to, drive engagement with, directly communicate with, and sell goods to fans via a growing number of mobile device apps opportunities. Start building a mobile experience for your fans today. There are plenty of mobile apps to choose from. Good luck! Wheng Enojo is a writer, inspirer, and life-enhancer. Currently, she is exploring and enjoying the world of DIY mobile apps as her newest hobby.